To update CalcZAF/Standard simply use the Help | Update CalcZAF menu! For more information on using CalcZAF and Standard, please visit the CalcZAF and Standard user forum where you can read questions, answers and discussion regarding the CalcZAF and Standard EPMA utilities (and please feel free to join the user forum if you have not already, so you can post your own questions and discussion). CalcZAF is intended for calculations on unknown compositions (for matrix corrections), while Standard performs calculations on known compositions (for searching, matching, modeling). 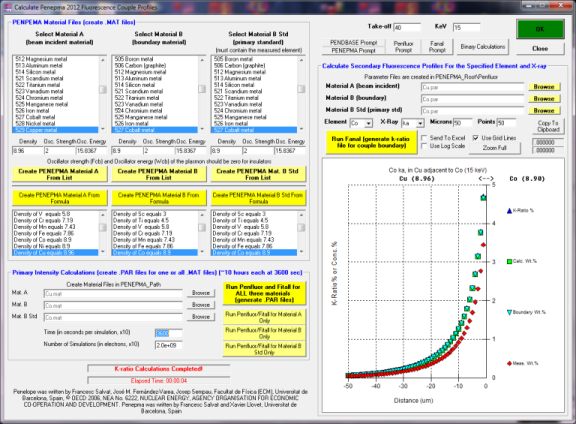 CalcZAF/Standard is an excellent off-line EPMA calculation utility for both teaching and research. Extensive technical documentation is included with the CalcZAF/Standard download and also available here. On-line data reference tables include: spectrometer position, emission lines, absorption edges, fluorescent yields, NIST x-ray tables and mass absorption coefficients. Quantitative modal phase analysis based on standard compositions. Full featured standard database utility with k-factor and x-ray intensity modeling. Additionally Standard.exe (which comes with CalcZAF) is automatically installed with the PENEPMA 2012 Monte Carlo modeling software (download Penepma12 updates manually here) to allow advanced operation with an easy to use Graphical User Interface (GUI) for spectrum simulation and secondary fluorescence phase boundary modeling. See below for installation instructions. X-ray and electron range modeling. Support for thin film and particle quantitative analysis (based on Armstrong code). Calculate error distribution histograms from experimental k-ratios and Bence-Albee alpha factor compositional plotting. Calculate detection limits for given conditions or conditions for given detection limit. Complete selection of CITZAF absorption, atomic #, etc. corrections. Heinrich, Henke, FFAST and/or Empirical mass absorption coefficients. Compositional searching and matching from multiple standard composition databases. Import/export raw K-ratios or count data. Standard composition reference databases (NIST, Deere, Howie and Zussman, Dana's ore minerals). Calculate any combination of elemental, oxide, element by specification, difference, relative to stoichiometric oxygen or any element. Formula, atomic percent, mineral end-member calculations. To install CalcZAF simply download the CalcZAF.msi file and double click it. The setup wizard will take you through the installation process. It will automatically be installed to the C:\Probe Software\Probe for EPMA folder, or another location if you prefer. Penepma 2012 is automatically installed by CalcZAF.msi. Once installed on your computer, CalcZAF can be automatically updated to the latest available version simply by using the Help | Update CalcZAF menu. The CalcZAF installation comes with CalcZAF.exe for modeling of unknown compositions using ZAF, Phi-Rho-Z, and Alpha Factor analytical models and also Standard.exe for modeling of known compositions and also easy to use GUIs for Penepma and Penfluor/Fanal Monte-Carlo modeling. CalcZAF also supports fast Monte-Carlo calculations using polynomial alpha factors derived from Penepma Monte Carlo k-ratio calculations. A list of fast Monte Carlo binaries already calculated can be found here. These alpha factor parameters provide high speed Monte Carlo calculations for arbitrary compositions. To perform secondary boundary fluorescence calculations using the Penepma 2012 GUI, run the Standard.exe program and click the Analytical | Penepma (Secondary Fluorescence Profile) Calculations menu. Penepma 2012 is automatically installed by the CalcZAF.msi installer file. To automatically update the Penepma files, simply use the Help | Update menu in CalcZAF. Or to manually update your PENEPMA 2012 folder simply download the PENEPMA12.ZIP file and extract all files to the Penepma12 folder and overwrite the existing files (usually C:\UserData\Penepma12). Additional pre-calculated compounds are available here (don't waste time re-running these 10 hour Monte-Carlo calculations yourself, if we already have!). 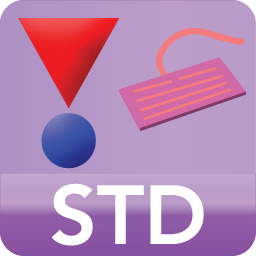 Simply download the Compounds.zip file and extract the PAR files to the C:\UserData\Penepma12\Penfluor\Compound folder to utilize these newly calculated compounds. A list of the currently available compounds is here. For a ZIP file of previously calculated PAR files for low energy modeling (500 eV and 200 eV), download this file. For easy extraction of k-ratios for Penepma unknown calculations, be sure to download this ZIP file containing a number of bulk pure element calculations at 10, 15 and 20 keV. Extracted to the C:\UserData\Penepma12\Penepma folder, these pure elements can be utilized to extract k-ratios from the Penepma Batch Mode window. 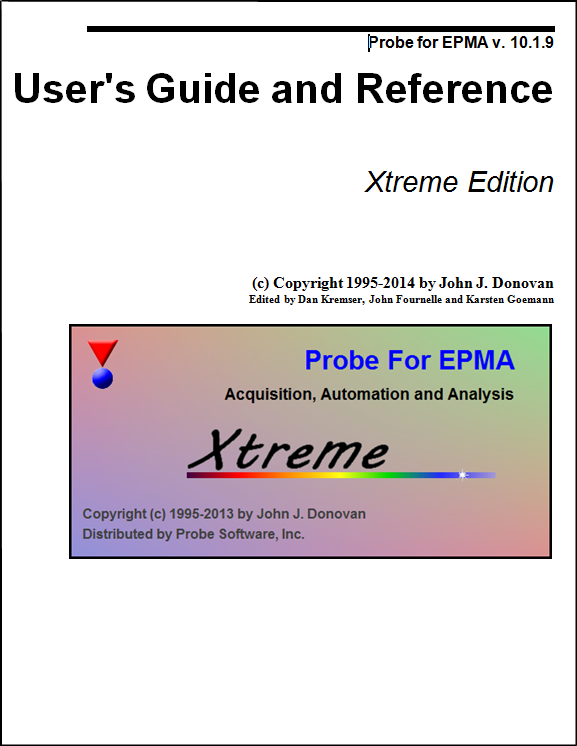 See our technical reference manual which is only part of the detailed and complete documentation provided with Probe For EPMA. All our documentation is written by experts in the electron microprobe community with an emphasis on solving real world problems in EPMA. Casino is a freeware program for quickly calculating and displaying electron-solid interactions for a variety of beam conditions and sample geometries. It was developed at the University of Sherbrooke, Quebec and McGill University, Canada by Raynald Gauvin, Hendrix Demers and Philippe Pinard. To install Casino simply extract all files in the ZIP to a folder, e.g., C:\Casino, and run the Casinov242.exe (for v. 2.4.2) or Wincasino2.exe or Wincasino2_64.exe (for v. 2.4.8 32 or 64 bit). Casino has been renamed to "MC X-Ray". To download the most recent version use this link.